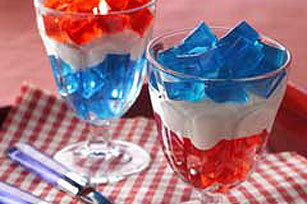 Achieving perfectly patriotic desserts is as easy as layering blue and red JELL-O Gelatin with creamy, dreamy COOL WHIP. Stir 1 cup boiling water into each flavor dry gelatin in separate large bowls 2 minutes until completely dissolved. Stir 1 cup cold water into gelatin in each bowl. Pour each gelatin flavor into separate 8-inch square pans. Refrigerate 4 hours or until firm. Cut gelatin in each pan into 1/2-inch cubes. Layer alternating flavors of gelatin cubes and the whipped topping in 10 dessert glasses. Store in refrigerator. Reduce whipped topping to 2 cups. Prepare gelatin as directed. Beat 1 pkg. (8 oz.) softened PHILADELPHIA Cream Cheese and 1/3 cup sugar in medium bowl with wire whisk until well blended. Gently stir in whipped topping. Layer alternating flavors of gelatin cubes and cream cheese mixture into 10 dessert glasses. Makes 10 servings, 1 parfait each.